Do Portland Bolt’s round plate washers meet the requirements of ASTM F844? If a purchaser specifies an ASTM F844 washer with the dimensions of Portland Bolt’s plate washers, then the washers do meet the requirements of F844. According to ASTM F844, a specification for general use steel washers, the washer dimensions must conform to ASME B18.21.1, Type A, Tables 1A and Tables 1B, unless otherwise specified. The F844 specification goes on to state in “Ordering Information” that dimensions other than B18.21.1, Type A must be called out when the order is placed. Furthermore, the specification states there are no chemical composition or mechanical property requirements, unless otherwise specified. Taking into consideration the information in the ASTM F844 washer specification, we can declare that the only requirements for F844 washers are the washers are made from steel and the washers conform to dimensional requirements, unless otherwise specified by the purchaser. If a purchaser specifies dimensions that align with Portland Bolt’s round plate washers then the round plate washers can be certified to ASTM F844. 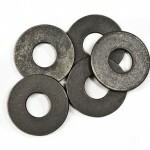 Are you allowed to substitute F436 hard washers when F844 cut washers are called out?